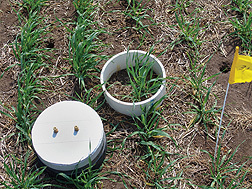 Winter wheat residue (left) and spring wheat (right) at an experimental site in southwestern Montana. In the fenced plots (far), sheep are allowed to graze on crop residue and weeds. ARS scientists are looking at different crop management techniques to improve soils, such as grazing, crop tillage, and no-till. For decades, farmers in Montana and the Dakotas have produced impressive yields of barley and wheat. But that bounty has come at a cost. Tilling the soil in the region’s crop-fallow production systems has robbed the soil of nutrients and organic matter and reduced crop yields. In fact, the region’s soils have lost up to 50 percent of their organic matter in the last 50 to 100 years, and scientists say that current practices are unsustainable. Agriculture also contributes about 25 percent of the human-made carbon dioxide and 70 percent of the human-made nitrous oxide being released into the atmosphere. Tillage, crop-fallow management practices, cropping sequences, and the use of nitrogen fertilizers all play significant roles in those emission levels. Agricultural Research Service scientists and their university partners are providing guidance to growers on ways to keep soils productive and reduce their climate change footprint by turning to some of agriculture’s most tried-and-true practices. At the ARS Agricultural Systems Research Unit in Sidney, Montana, Upendra Sainju and his colleagues have been studying how no-till systems, crop rotation, ecological (or alternative) cultural practices, nitrogen fertilization, and sheep grazing can improve soil quality, reduce greenhouse gas emissions, sustain crop yields, and reduce the amount of nitrogen polluting the air and water. White-faced sheep grazing on crop residue and weeds at the experimental site. Growers have known for decades that no-till improves soil quality and that rotating crops reduces weeds, diseases, and pests. Grazing by livestock is also widely known to control weeds and pests and supply a natural fertilizer. The ARS studies in Montana and North Dakota are among the first to show how these systems are feasible alternatives that do not result in reduced yields. The research is also one of the first comprehensive efforts to examine the effects of irrigation and different crop management scenarios on greenhouse gas emissions in the northern Great Plains. “These are issues that affect not only growers, but also the environment,” Sainju says. 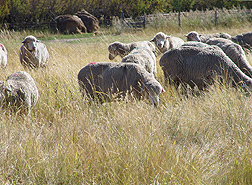 Grazing sheep and other livestock on cropland was common in the region before commercial fertilizers were introduced in the 1950s. Fertilizers have increased yields, but they also have increased nitrogen runoff and leaching, made soils more acidic, and contributed to greenhouse gas emissions. Some growers looking for alternatives, particularly those with organic operations, have turned to grazing sheep during seasons when fields are left fallow. The trend in Montana and North Dakota prompted Sainju and his colleagues to study the effects of grazing on crop quality, soil chemistry, and amounts of nutrients in the soil, each of which can have long-term effects on yields. Sainju and his colleagues set up three cropping systems (continuous spring wheat, spring wheat-fallow, and winter wheat-fallow) in southwestern Montana and compared soil qualities on plots where, during the fallow season, sheep were grazed, herbicides were used, or the soil was tilled for weed control. Over 4 years, sheep were grazed at rates of up to 153 sheep per hectare, glyphosate was applied at standard rates, and soils were tilled to a standard 15 centimeters depth. Soil samples from varying depths were analyzed for organic matter, nutrients, pH, and electrical conductivity. Results showed that tillage returned more of the beneficial wheat residue to the soil than either grazing or the herbicide treatments, resulting in higher levels of calcium, sulfur, and electrical conductivity in the soil. The different cropping sequences had mixed effects. The spring wheat-fallow sequence returned the least amount of residue to the soil, and the continuous spring wheat produced higher annualized yields than the spring wheat-fallow system. Grazing sheep returned some of the phosphorus and potassium in the wheat residue to the soil by way of feces and urine, but weed growth between grazing bouts reduced available concentrations of those nutrients. Grazing increased soil levels of magnesium and sodium, possibly because the urine and feces contained higher levels of them. In general, the results showed that grazing had no negative effects on soil organic matter and crop yields and that growers could offset the reduced levels of phosphorus and potassium by limiting the amount of grazing or fertilizing fields with those nutrients. The results were detailed in papers published in Agronomy Journal in 2010 and Soil Science Society of America Journal in 2011. Close-up of a static chamber in a field of malt barley. The chamber is used to collect greenhouse gas samples coming off this tiny section of the plot. Sainju and his colleagues also evaluated the effects of different management practices in eastern Montana, where irrigation is rarely available for most crops. They grew spring wheat in some areas and in alternative plots rotated it with hay barley, corn, and peas over a 4-year rotation cycle. The researchers tilled some plots, left others untilled, and used two different cultural practices to control weeds and apply nitrogen fertilizer. In some plots they used traditional cultural practices that included conventional seeding rates and planting dates and broadcast systems to apply fertilizer. In others, they delayed planting for 2 to 3 weeks and seeded plots in arrangements specifically designed to minimize weed competition. In those areas, they placed fertilizer directly into the soil rather than broadcasting it, and they left taller postharvest stubble on the ground. Delayed planting allows growers to terminate weeds with herbicides at a stage when the weeds are more fully developed, which reduces their threat to the crop later in the growing season. Placing nitrogen fertilizer directly in the soil reduces nitrogen runoff, and leaving tall stubble also means fields capture more snow in the winter, increasing soil moisture and boosting crop yields. The researchers say their no-till, 4-year rotation cycle alsooffers numerous advantages. No-till conserves soil water, reduces soil erosion, and increases organic matter compared to conventional tillage. Including hay barley and pea in the rotation with cereal crops uses less soil water, resulting in more water available for succeeding crops. Peas also supply nitrogen to the soil and reduce the need for nitrogen fertilizer. “It’s a system that uses soil water and nitrogen more efficiently, increases soil organic matter, reduces the risk of crop failure from drought, and uses less nitrogen fertilizer, up to 20 pounds less per acre,” Sainju says. The researchers published three papers based on the field work. In one, they evaluated the effects of the different management practices on crop residue and soil organic matter levels. In another, they examined carbon sequestered in the soil and labile carbon fractions by analyzing levels of soil surface residue, microbial biomass and activity critical to soil health, and other factors. In the third study, they looked at levels of nitrogen in the soil being “cycled” into the crops. Nitrogen cycling is a critical environmental issue because crops need to take up nitrogen to grow, but if too much nitrogen is in the soil it can be released in the air as nitrous oxide or leach into waterways. Together, the results of the studies showed that no-till with the traditional cultural practices increased soil organic matter, led to higher carbon sequestration rates, optimal nitrogen cycling, and higher levels of the kinds of microbial biomass and activity important for soil health. Conventional till to control weeds with diversified crop rotation also increased nitrogen mineralization and availability. The soil organic matter study results were published in Plant and Soil (2011). The carbon fractions study was published in the Open Journal of Soil Science, and the nitrogen cycling study appeared in Nutrient Cycling in Agroecosystems, both in 2012. In another experiment, the researchers evaluated the effects of irrigation, tillage, cropping systems, and nitrogen fertilization on greenhouse gas emissions from five cropping systems in sandy loam soil in western North Dakota,where growers can irrigate fields. They also studied three cropping systems under dryland conditions in loam soil in eastern Montana. For 4 years, they raised conventionally tilled malt barley with and without nitrogen fertilizer, no-till malt barley with and without nitrogen fertilizer, and a no-till malt barley-pea rotation with and without nitrogen fertilizer. Some systems were irrigated and others were not, and the researchers tracked soil temperatures and soil water content; measured plant biomass; and used static, vented chambers to measure greenhouse gases. Results, described in the Journal of Environmental Quality (2010) and in the Soil Science Society of America Journal (2012), showed that regardless of whether the field was irrigated, the no-till malt barley-pea rotation with reduced rate of nitrogen fertilization was the most effective system for reducing greenhouse gas emissions and sustaining crop yields. They also found that the no-till barley-pea rotation reduces the need for nitrogen fertilizer with no effect on yields. The studies are prompting growers in Montana and the Dakotas to graze sheep more readily, adopt no-till systems, rotate crops, and use less nitrogen fertilizer. Growers are seeing how no-till crops can be grown every year instead of leaving the land fallow for a year, a common practice in the region. Rotating legumes like peas with nonlegumes also reduces the need for nitrogen fertilizers and the likelihood that nitrogen will flow into water supplies and air as greenhouse gas. “The benefits are apparent. To some extent, it’s just a matter of getting the word out,” Sainju says.—By Dennis O'Brien, Agricultural Research Service Information Staff. The research is part of Agricultural System Competitiveness and Sustainability (#216) and Water Availability and Watershed Management (#211), two ARS national programs described at www.nps.ars.usda.gov. Upendra Sainju is in the USDA-ARS Agricultural Systems Research Unit, 1500 North Central Ave., Sidney, MT 59270; (406) 433-9408. 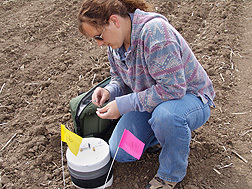 "Cultural Practices To Maintain Soil Quality and Address Climate Change" was published in the March 2013 issue of Agricultural Research magazine.